* Moderately bullish-Although the outlook is for higher prices, the increase is not likely to be dramatic. * Moderately bearish - Although the outlook is for lower prices, the decrease is not likely to be dramatic. * Neutral (front spread) - Expecting little price movement over a given time period. Neutral strategies enable the trader to make money in a market where prices remain the same or move little. * Volatile (back spread) - The anticipation that prices will move dramatically, but the direction of that move is not clear. Our goal in separating our discussion of strategies into the four general categories of bullish, bearish, neutral, and volatile is to provide our readers (after determining your market outlook) with a reference for the potential strategies. This chapter will also discuss risk-reduction strategies for managing an existing stock portfolio. 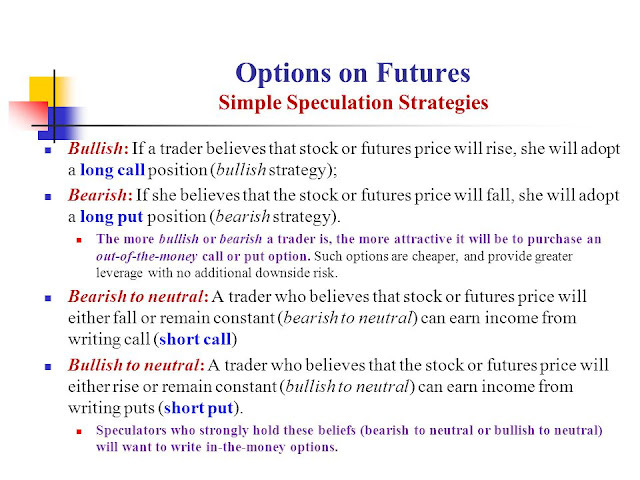 A number of these strategies involve option spreads. You construct a spread by being long an option(s) and being short an option(s) of the same type in the same underlying asset. For example, buying a call and selling another call with a different strike or a different expiration is a spread. Buying a put and selling another put with either a different strike or a different expiration is also a spread. In contrast, buying a call and either buying or selling a put is not a spread. 1. Calendar spread (in other words, a time or horizontal spread)-With this type of spread, all options are of the same type and have the same strike price and underlying asset, yet they have different expiration dates. The purchase (sale) of one option has a different expiration date from the sale (purchase) of another. Buying one XYZ March 85 call, for example, and selling one XYZ February 85 call would be a calendar spread. 2. Diagonal spreads-This kind of spread is similar to the time spread in that the options are of the same type and underlying asset; however, the expiration date and the strike prices are different. This time spread uses different strike prices. Buying one XYZ March 90 call and selling one XYZ February 85 call is an example of a diagonal spread. 3. Vertical spread-A vertical spread consists of options of the same type, on the same underlying asset, and with the same expiration date, but these options have different strike prices. Buying one XYZ May 90 put and selling one XYZ May 85 put is an example of a vertical spread. 4. 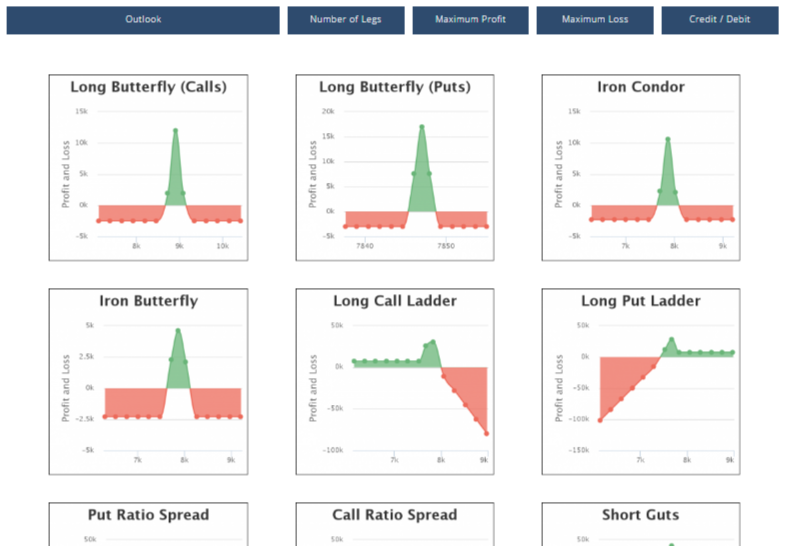 Ratio spreads-A ratio spread is any of these types of spreads in which the number of options purchased differs from the number of options sold. Buying one XYZ July 90 call and selling two XYZ July 95 calls is an example of a ratio spread. 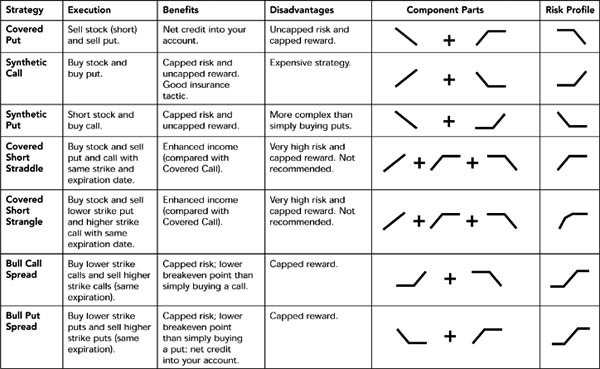 Several strategies involve three or more options strikes. As a practical matter, you cannot put on these positions simultaneously at reasonable prices. 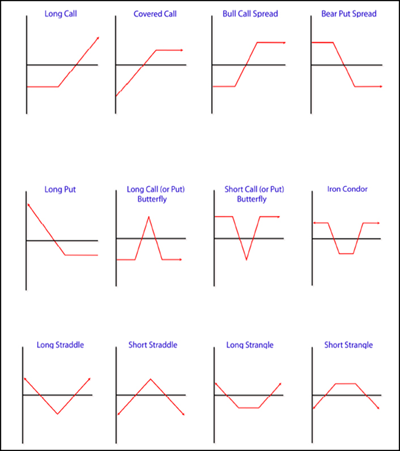 In order to achieve these positions at prices that produce an acceptable risk/reward profile, you must put on the positions in a series of separate trades. This process is called legging. Although the analysis of these specific positions includes a discussion of how to approach legging, we should give you some general comments concerning legging at this point. Until a position is fully legged into, your ability to complete the position at an acceptable price is subject to the risk of changing prices in the positions that you have not yet executed. 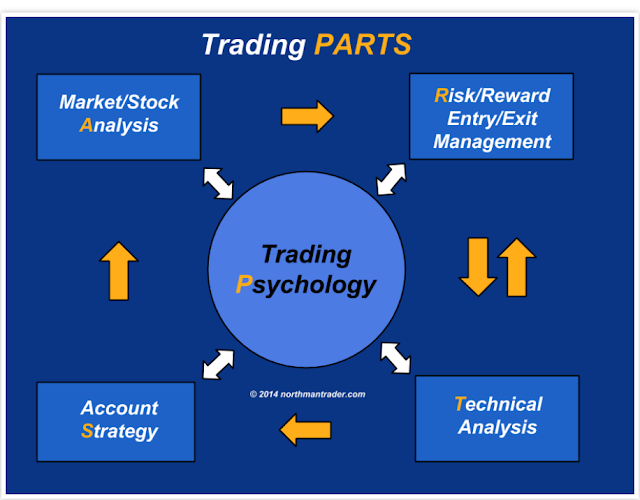 The key to legging is knowing which order to execute the trades in order to minimize that risk. To minimize this risk, we look at the supply and demand factor of each building block in the options strategy. Once we determine the supply and demand for each building block, the trader can leg into the position first from the building block that has the most demand and finish the implementation with the building block that has the most supply. This procedure is called legging the hard side first. The hard side is the trade that is the most difficult to put on. 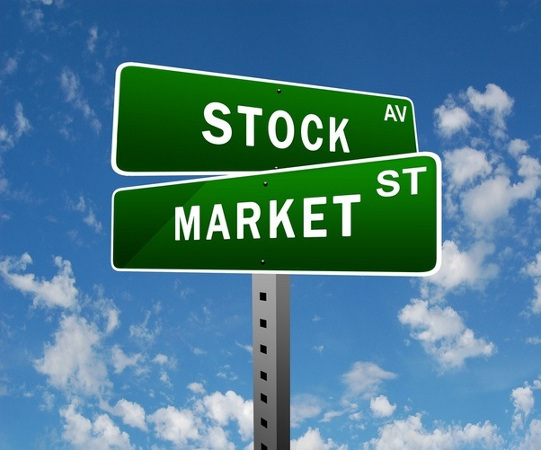 If the stock is rising rapidly in price and the trader wishes to purchase the stock, because the stock is rising, this side is considered the demand side. first. Assume that you are legging into a covered call in which the stock price is rising. Realizing that it will be harder to purchase the stock at a good price than it will be to sell the call, you should buy stock as the first part of the leg. Selling the call would be the easier of the two sides to fill, because the rising price of the stock should increase the demand for the call. If the trader decides to sell the call first in a rising market, he or she is taking the chance that he or she might not be filled on the stock at his or her price. When a trader puts on a leg and cannot complete the rest of the position because the price for remaining legs has become unacceptable, the trader is said to be legged out. He or she now has a position that has gone against him or her, and it will be hard to close it without incurring a loss. Some of the option positions that we cover in this book can only be legged into. Do not even bother calling your broker with any fancy spread terminology such as a butterfly or iron butterfly: The market makers on the trading floor will just laugh your broker right out of the trading pit. There is no market maker in the world who will hand over free money, especially to a customer. Bullish strategies are among the most common strategies that individual investors use, probably resulting from the general view of the market that we acquire through the media and elsewhere is that rising stock prices are good, and falling stock prices are bad. In actuality, your position relative to that market movement-not the movement itself-is either good or bad for you. For example, if you position benefits from a declining market and the market does decline, that is good, while if instead it rallied, that would be bad. Most investors, then, are programmed to buy low and sell high. These are bullish investors who want to gain a profit from a rise in value or stock price. In fact, when investors tend to think of bullish strategies, the only thing that typically pops into their head is to purchase stock. To be sure, this strategy is great when the stock rises in price, but when a hefty sum of the investor's capital is committed to the position, this endeavor can be risky: In other words, while long stock purchase is not necessarily the wrong idea, it can be capital intensive and can create risk parameters that the individual investor might not totally understand. In this topic, we will show alternatives to purchasing stock, learn how to reduce market directional risk and capital exposure, and discuss the relevance of leverage. The first bullish strategy we will consider is long stock. Because long stock is the most commonly employed strategy and the one with which most traders are familiar, it will offer a good comparison study against the other bullish strategies described in this topic. 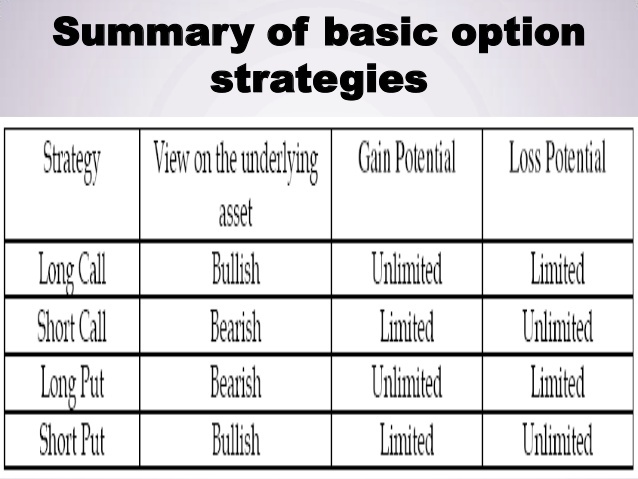 The concepts outlined in this chapter form the basis for the option strategies in Part Two. These concepts expand on the basics in Chapter 3. 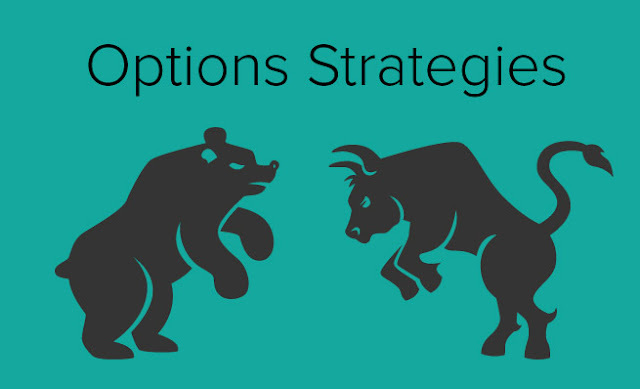 They are not necessary for most traders who are mainly looking at option strategies to hold to expiration. The first topic in this chapter will be a quick introduction to option pricing models, particularly the Black-Scholes Model. Also discussed will be the greeks and how they affect the price of an option; probability distributions and how they affect options; option pricing models and their advantages, disadvantages, and foibles and using them. The final major topic will be the concept of delta neutral. which is a key concept for many of the advanced strategies in this book. Which option should you buy? What if you are looking for the price of Widget futures to move from 50 to 60 over the next four months? Do you buy the option that expires in three months and roll it over near expiration? Or do you buy the six-month option and liquidate it in four months? The answer to these questions is whichever option maximizes profit for a given level of risk. * What is a particular option worth? * Is the option over- or undervalued? * What will the option price be under different scenarios? Option pricing models provide guidance, not certainty. The output of an option pricing model is based on the accuracy of the model itself as well as the accuracy and timeliness of the inputs. 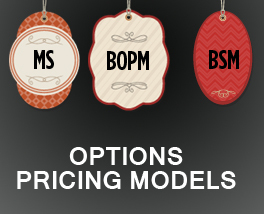 Option pricing models provide a compass to aid in evaluating an option or an option strategy. However, no option model has yet been designed that truly takes into account the totality of reality. Corners are cut, so only an approximation of reality is represented in the models. The model is not reality but only a guide to reality. Thus, the compass is slightly faulty, but having it is better than wandering blindly in the forest. Option pricing models allow the trader to deal with the complexity of options rather than be overwhelmed. Option pricing models provide a framework for analysis of specific options and option strategies. They give the strategist an opportunity to try out “what if” scenarios. Although option pricing models are not 100 percent accurate, they provide more than enough accuracy for nearly all option trading styles. The inability to account for the last tick in the price of an option is essentially irrelevant for nearly all traders. On the other hand, arbitrageurs, who are looking to make very small profits from a large number of trades, need to be keenly aware of the drawbacks and inaccuracies of option pricing models. They must look at every factor through a microscope. One early book that was related to options pricing was Beat the Market by Sheen Kassouf and Ed Thorp. This book sold very well and outlined a method of evaluating warrants on stocks, which are essentially long-term options on stocks. However, these models that came before the Black-Scholes Model are rarely mentioned today mainly because of two factors: (1) they were not arbitrage models; and (2) options were not popular, so few traders or academics were paying attention to options pricing problems. 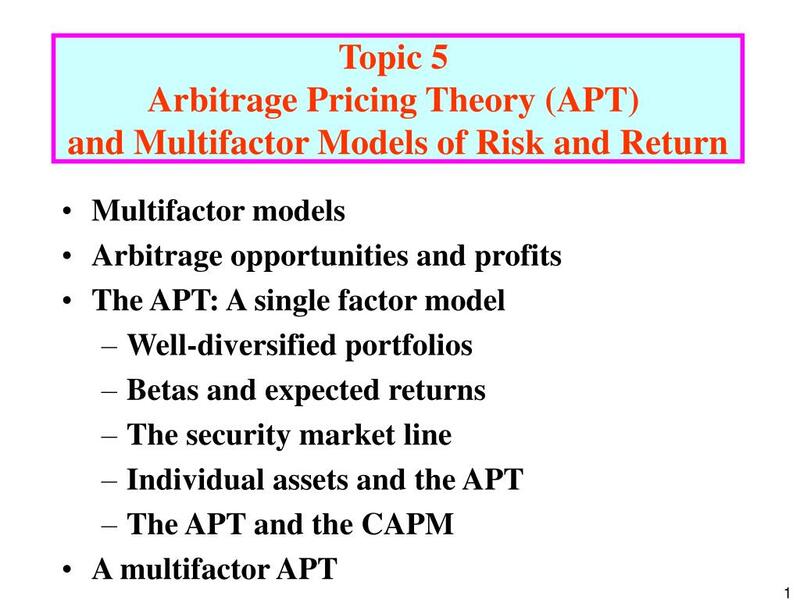 An arbitrage model is a pricing model in which all the components of the model are related to each other in such a way that if you know all of the components of the model but one, you can solve for the unknown component. This applies to all of the components. It ties up all the factors relating to the pricing of an option in one tidy package. Furthermore, an arbitrage model is a model that prices the option, given certain inputs, at a price where the buyer or seller would be ambivalent between the UI and the option. Each model takes a look at evaluating options from a different perspective. Usually the goal of the model is to better estimate the fair value of an option. Sometimes the goal is to speed up computation of the fair value. 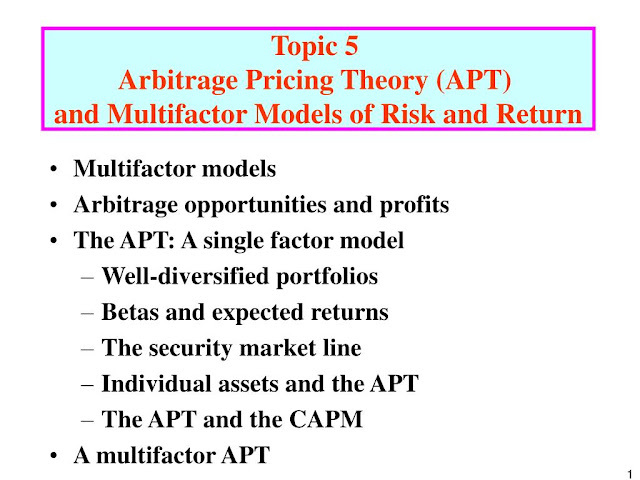 The first arbitrage model is the most famous and most popular option pricing model—the Black-Scholes Model. Professors Stanley Black and Myron Scholes were fortunate that they published their revolutionary model just as the Chicago Board Options Exchange (CBOE) was founded. The opening of the CBOE shifted the trading of options from a small over- the-counter backwater of the financial community to a huge and growing market and created a demand for greater information about options pricing. The Black-Scholes was deservedly at the right place at the right time. 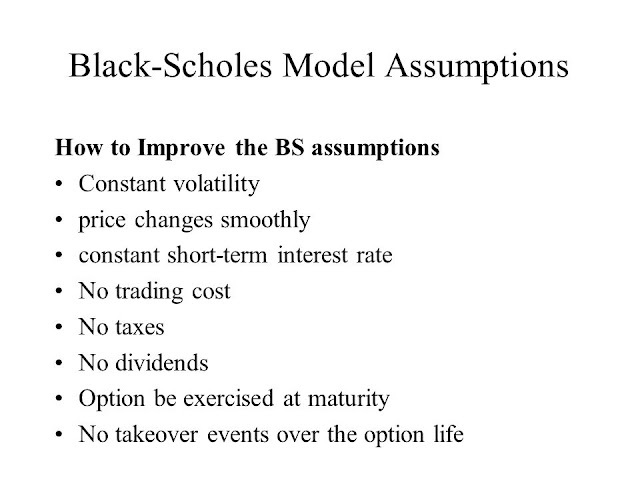 The initial version of the Black-Scholes Model was for European options that did not pay dividends. They added the dividend component soon after. Mr. Black made modifications to the model so that it could be used for options on futures. This model is often called the Black Model. Mark Garman and Steven Kohlhagen then created the Garman-Kohlhagen Model by modifying the Black-Scholes Model so that it gave more accurate pricing of options on foreign exchange. 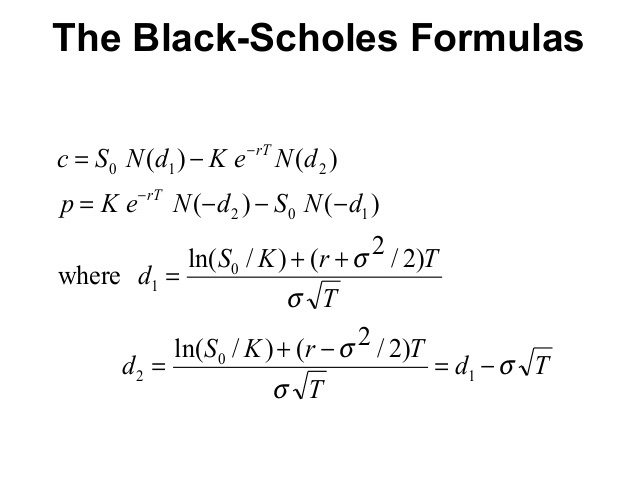 All of these versions of the Black-Scholes Model are similar enough that they are often simply described generically as the Black-Scholes Model. Another popular model is the Cox-Ross-Rubenstein, or Binomial, Model. This model takes a different approach to the pricing of options. However, many option traders feel that it is generally more accurate than the Black-Scholes Models. The main drawback, however, is that it is computationally more time consuming. 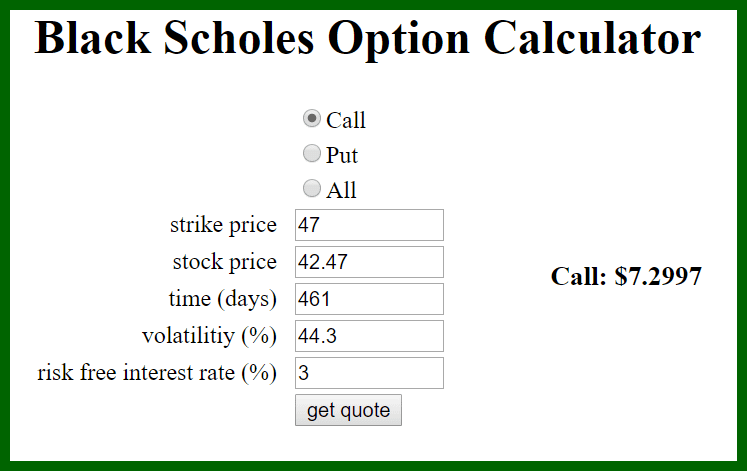 The Black-Scholes Model is used only for pricing European options. Yet most options traded in the world are American options, which allow for early exercise. It has been found, however, that the increase in accuracy from using a true American-pricing model is usually not worth the greater cost in computational time and energy. This is particularly true with options on futures. Arbitrageurs will sometimes shift to an American pricing model when a stock option gets near expiration or becomes deep in-the-money. These are the circumstances when the chances of early exercise become more likely and the greater accuracy of a model that prices American-style options becomes more important. 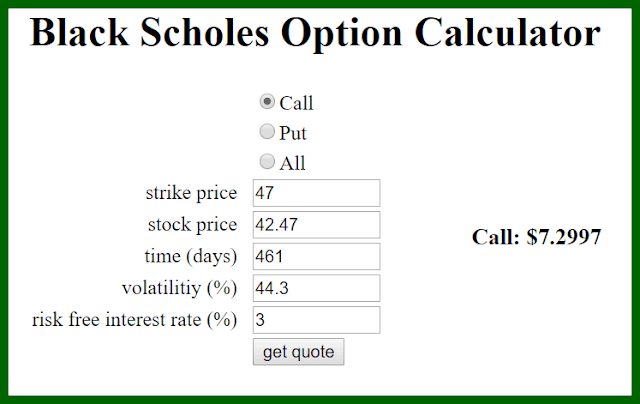 Another apparent oddity is that the Black-Scholes Model does not price put options, only calls. However, the price of a put can be found by using the model to price a call and using the put-call parity principle. The Black-Scholes Model assumes that two positions can be con- structed that have essentially the same risk and return. The assumption is that, for a very small move in either of the two positions, the price of the other position will move in essentially the same direction and magnitude. 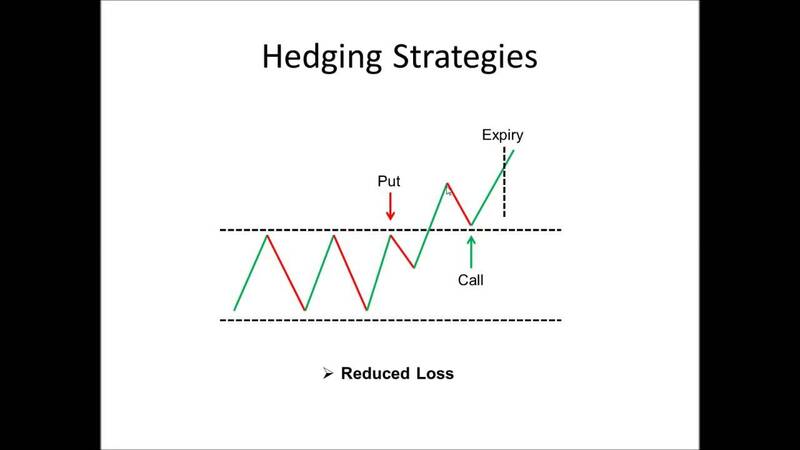 This was called the riskless hedge and the relationship between the two positions was known as the hedge ratio. 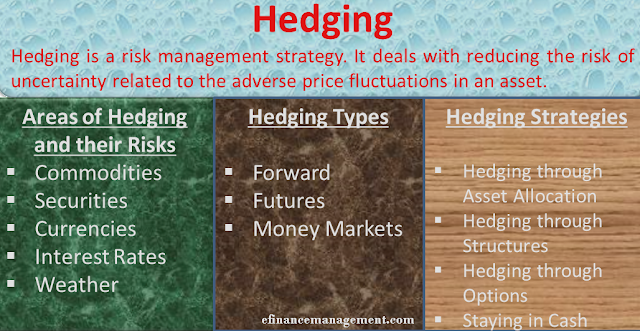 Generally speaking, the hedge ratio describes the number of the underlying instrument for each option. 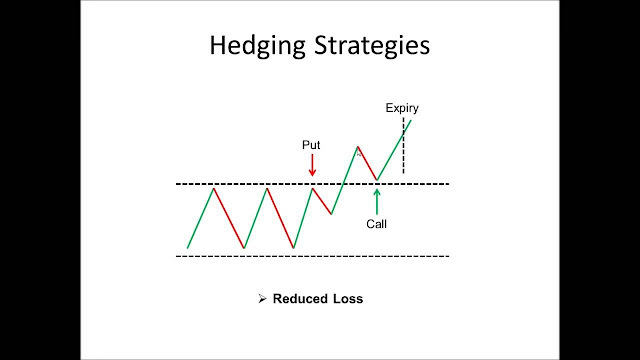 For example, a hedge ratio of 0.50 means that one half of the value of one option is needed to hedge the option. In the case of a stock option, a hedge ratio of 0.50 would mean that 50 shares of the underlying stock are needed to hedge one option. In the case of an option on a futures contract, a hedge ratio of 0.50 would mean that one half of a futures contract is needed to hedge the option. Clearly, one can-not hold only one half of a futures contract, but that is how many would be needed to theoretically hedge the option on that futures contract. Given this information, the model can be used to find the fair price of the option. But suppose the current price of the option was known, and what was wanted was the expected volatility that was implied in the price of the option. No problem. The Black-Scholes Model could be used to solve for the expected volatility. The model can be used to solve for any of the listed factors, given that the other factors are known. This is a powerful flexibility. A further advantage of the model is that the calculations are easy. The various factors in the model lend themselves to easy calculation using a sophisticated calculator or a simple computer. The calculations with other models, which might give better results, take so long that they have limited use. Option traders are usually willing to give up a little accuracy to obtain an answer before the option expires! 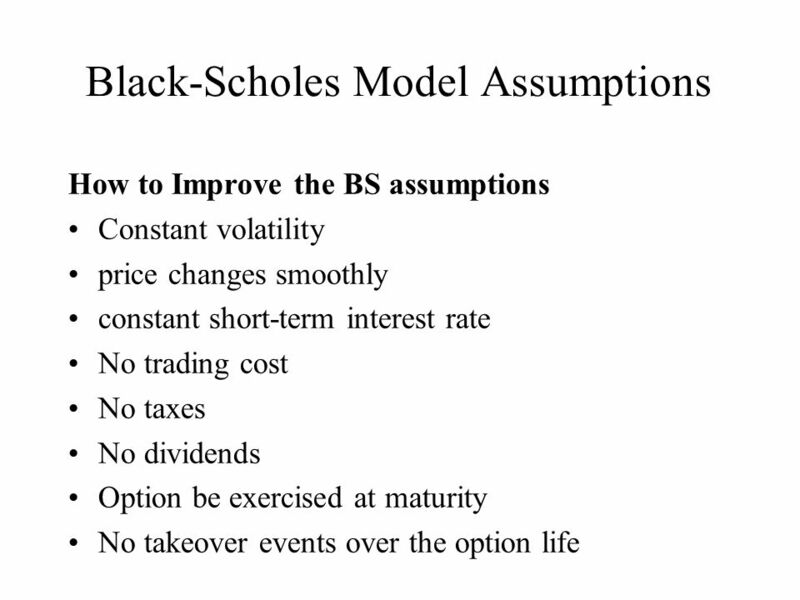 The Black-Scholes Model is the standard pricing model for options. It has stood the test of time. All of the examples in this book, and virtually all other books, are derived using the Black-Scholes Model. However, the model has some drawbacks. As a result, the model is no longer the standard for options on bonds, foreign exchange, and futures, though the standard models for these three items are modifications of the original. Examining the assumptions of the Black-Scholes Model is not done to criticize the model but to identify its strengths and weaknesses so that the strategist does not make a wrong move based on a false assumption. The current price of the UI is usually known with some certainty for most option traders. They can look on the screen or call their broker and get a price for the UI. It usually does not matter if the price quote is a little wrong. However, arbitrageurs often have a problem determining exactly what the price of the UI is. They ask: How wide is the bid/ask spread? Is the last trade on the bid, in the middle, or on the ask? Has the bid/ask spread moved since the last trade? Are prices extremely volatile, and will I have a hard time executing a trade at the current bid or ask because the bids and offers are moving so much . Fortunately, this one factor is stable and does not change significantly. Strike prices for stock options do change whenever there is a stock split or a stock dividend. The Black-Scholes Model assumes that setting up the right relationship between the UI and the option will lead to a neutral preference by the investor. The value of the UI and the value of the option will be balanced because the Black-Scholes Model is an arbitrage model. The model assumes that the so-called risk-free rate is the proper rate. Traditionally, the risk-free rate is considered the rate paid on U.S. government securities, specifically, Treasury bills, notes, and bonds. To make the model work, it is assumed that interest is being paid or received on balances. It is assumed that all positions are financed, an assumption that is reasonable because there is always an opportunity cost even if the position is not financed. The Black-Scholes Model assumes that you would invest your money in Treasury bills if you did not invest it in an option. The term of the interest rate used in the model should be the term to expiration of the option. For example, if you are pricing an option that matures in 76 days, then you should theoretically use the interest rate corresponding to a Treasury bill that matures in 76 days. In the real world, of course, you would simply select a Treasury bill that matures close to that perfect number of days. The problem is that the model assumes that you both invest your money and borrow money at the risk-free rate. It is quite reasonable to assume that you will invest your money in Treasury bills in the real world. However, only the U.S. government can borrow at the Treasury-bill rate. All other borrowers must pay more, sometimes much more. As a result, some options traders assume that they invest at the Treasury-bill yield but that they borrow at the Eurodollar yield or at the prime rate. In general, the rate assumed in the model will have little effect on the price of the option. The level of interest rates mainly affects the price of multi year options. The probability distribution is the expected future possible distribution of prices, that is, the probability that any price will occur in the future. The model basically assumes that prices are randomly distributed around the current price in roughly a bell shaped curve. Expected volatility is the volatility of the price of the UI expected in the future by the investor or the market. Expected volatility is the width of the bell curve mentioned in the preceding paragraph. Fortunately, the number of days to expiration of the option does not change. The Black-Scholes Model does not take into account the effect o taxes on the pricing of options. In fact, no major model does. This is not a major problem, but it might affect some arbitrageurs. For example, it was shown that the model assumes the risk-free or T-bill rate as the interest rate, but that is not usually the case in the real world: The investor might be receiving T-bill interest, which is exempt from state and local taxes, but paying the equivalent of Eurodollar rates or even the prime rate. 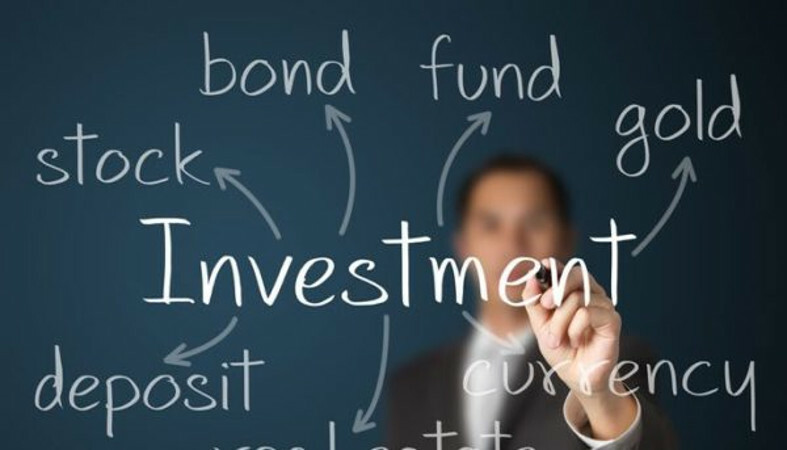 The investor might or might not be able to deduct the cost of the borrowing from the proceeds of the trade. Some traders will be taxed differently on the interest or dividend in- come than on the gain or loss from the option. Interest and dividend in- come are usually ordinary income, whereas gains and losses from options are capital gains and losses. Taxes are an important subject but beyond the scope of this book. Variations in taxes could have an impact on the fair price of an option for a particular trader. When two or more of these inputs changes, the changes can either act to offset each other in whole or in part or can work in concert to magnify either the increase or decrease in price. The situation is further complicated when options are used in combination. Fortunately; there are analytical tools available to simplify the analysis of option positions. 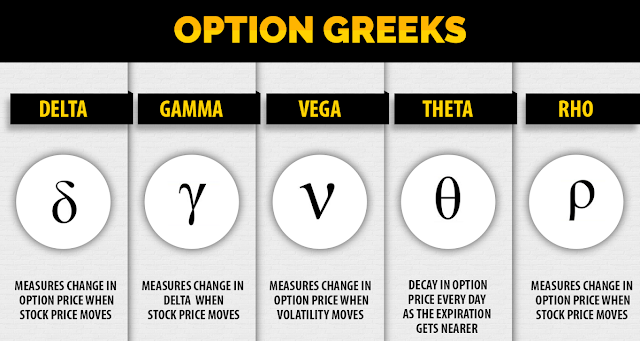 These tools are commonly referred to collectively as the Greeks and individually as delta, theta, gamma, rho, vega, and omega. Individually; they each measure some aspect of an option position's market risk/reward profile. This statement is true whether the position is a simple one involving one or perhaps a few different options or an extremely complicated position (such as a professional floor trader who has scores of different option contracts-some of which are long and some of which are short-and who may have a long or short position in the underlying asset). Collectively; the Greeks provide the practiced trader with a comprehensive assessment of a position's risk/reward profile. 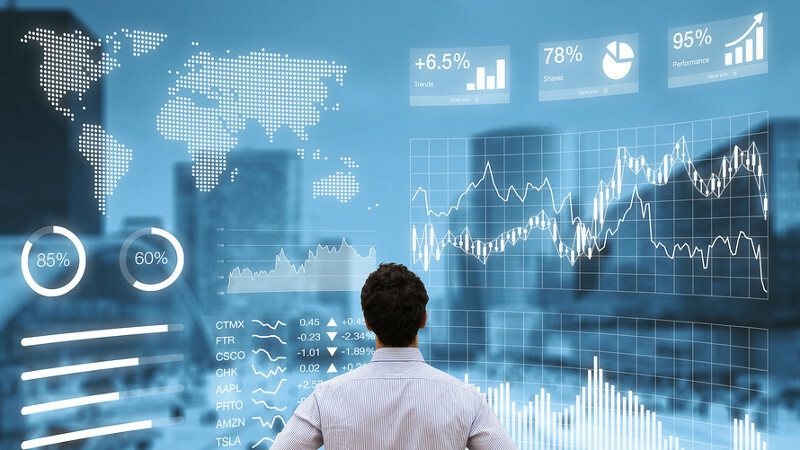 Not only will the trader have an accurate picture of which market conditions will enhance the value of the position and which will subject it to a loss of value, but the trader will be in a position to determine what adjustments are appropriate in order to reflect the trader's current expectations concerning the stock. The trader can also reduce exposure to one or more aspects of market risk. 1. As the price of ABC increases, the price of the 60-level call also increases-while the price of the corresponding put decreases. With the stock at $50, the theoretical values of the call and put are $.41 and $10.25, respectively: By the time the price of the stock reaches $55, for example, the theoretical value of the call has risen to $1.46. The put's theoretical value has declined to $6.23. 2. As the price of ABC increases, the price of the call increases while the price of the put decreases. With the stock at $50, a $1 increase in the stock theoretically produces a $.14 increase in the price of the 60- level call and a $.87 decrease in the price of the corresponding put. The call increases in price by $.29 when the stock increases from $54 to $55 and by $.80 when the stock increases from $66 to $67. Correspondingly, the put declines by $.72 when the stock goes from $54 ton $55 but only by $.21 as the stock increases from $66 to $67. 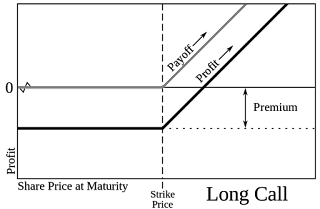 The relationship between the change in the price of a stock and the corresponding change in the price of an option is referred to as the option's delta. 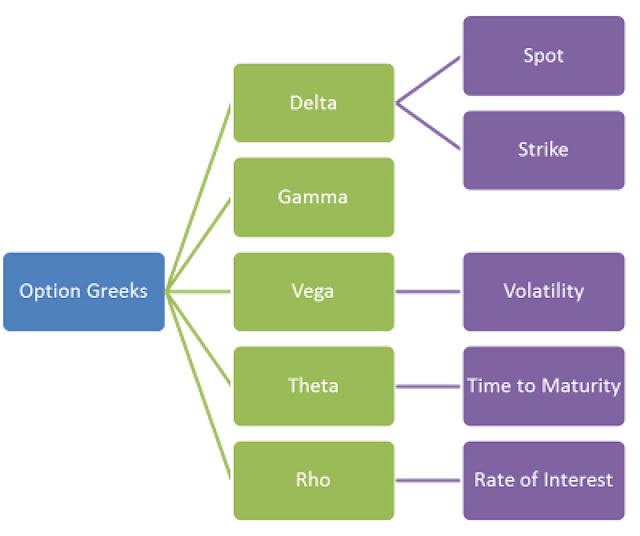 The delta is the most widely known of the Greeks and is an extremely important gauge of any option strategy. Delta measures how sensitive an option's price is to change in the value of the underlying stock. There are two particularly useful ways to look at delta: the measure of how much the option's price will change compared to a change in the price of the underlying asset, and the approximate probability that the option will finish ITM. We will explore both of these perspectives in some detail. An option's delta is the ratio of the change in its the or etical value to a small change in the price of the underlying stock. More commonly (but marginally less precise), delta is defined as how much an option's price changes for every $1 change in the price of the stock. A positive delta means that an option's price moves in the same direction as price movement in the underlying asset. An option that has a positive delta will increase in value as the underlying asset increases in value and will decrease in value as the price of the underlying asset decreases. Conversely; a negative delta reflects the fact that an option's price moves in the opposite direction from the price movement in the underlying asset. stock price declines. Going back to the table presented earlier in this chapter, with ABC stock trading at $50, the fact that the 60-level call's price would theoretically increase by $.13 when the stock price increased $1 to reach $51 indicates a delta of .13. In comparison, the delta of the 60- level put with the stock trading at $50 would be - .87. Because one equity option contract generally represents options on 100 shares of the underlying asset, the delta is most commonly expressed as the aggregate change in price of the option contract for a $1 change in the underlying asset. In other words, the delta for one option is multiplied by 100 (the number of shares represented by one contract). Under this approach, the 60-level call with ABC trading at $50 would have a delta of 13, not .13. From now on, we will refer to option deltas by using this aggregate designation. Many option strategies and positions include holdings in the underlying asset, which can be long or short. When you are determining the delta for a complicated position that includes a combination of options and/or positions in the underlying asset, the aggregate delta of the entire position is most relevant. Using the same ratio definition of the delta as for options, the delta of one share of long stock is + 1, while the delta of one share of short stock is -1. Therefore, if a position included 1,000 shares of stock, this stock would contribute 1,000 deltas to the aggregate position delta. On the other hand, if the position included a short of 1,000 shares, this short position would contribute -1,000 deltas to the aggregate position delta. * An ATM option typically has a delta of about +50 for calls and -50 for puts. * With the stock trading at or near a strike price, give the nearest ITM options a delta of 75 and the next-closest ITM options a delta of 90. Then, estimate the deltas of all other ITM options to be 100. 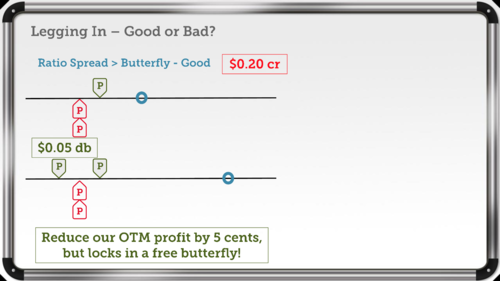 * With the stock trading at or near a strike price, give the nearest OTM options a delta of 25 and the next-closest OTM options a delta of 10. All other OTM options should receive a zero delta. For example, if XYZ were trading at $60, we would approximate option deltas as shown in Table. As you learned in the previous chapter, being long a call and short a put with the same strike and expiration is the equivalent of being long 100 shares of the underlying asset (synthetic long stock). Because long 100 shares always represent an aggregate 100 deltas, combining the deltas of the long call and the short put with the same strike price and expiration date must also always equal 100. Similarly; the aggregate delta of a short call, long put position with the same strike price and expiration date will be -100, the equivalent of being short 100 shares of the underlying asset. This example highlights an important relationship between the deltas of puts and calls with the same strike price and expiration date. If you know one, you can easily determine the other. For example, if the March 60 call has a delta of +38, the delta of the March 60 put is -62. An easy way to think of delta is as the probability that the option will finish ITM upon expiration. The ATM calls and puts each have a 50-50 (or 50 percent) chance of finishing ITM upon expiration and both carry an approximate delta of 50. The ITM calls and puts have a much greater chance of finishing ITM upon expiration than their ATM counterparts with a deeper ITM call or put having a higher likelihood of finishing ITM than one that is less ITM. Their deltas reflect those respective probabilities. The OTM options have the least percentage chance of finishing ITM and not surprisingly; their small deltas reflect this decreased probability. * the time until expiration decreases. The delta of an ATM option will remain at 50, because it still has a 50-50 chance of finishing ITM. * The delta of an OTM option will move towards zero as expiration approaches, because the likelihood of the option finishing ITM decreases as the time until expiration decreases. examples of delta and time until expiration. As we can see from these examples, strike prices at differing expiration dates have different deltas. Hence, as the time until expiration increases, the probability that the underlying asset will move towards.